No doubt today’s biggest news in the LBS and mobile blogosphere is that Microsoft and Nokia are forming a strategic partnership in the smartphone market. It’s early days for any form of conclusions, but we can try to make some predictions on what impact this may have on the market for Location Based Services on mobile phones. In spite of common perception, digital maps are not free. They are actually sold by companies such as Tele Atlas, AND and… NAVTEQ. Because of the high investments needed to build a new mapping database, a de facto worldwide oligopoly has formed around a handful of companies that have global reach in this space. The fact that most of them have been gobbled up by big players, doesn’t mean they are not selling this data to third parties (e.g. Google). The awkwardness of this situation becomes apparent through the continued efforts of Google to become less dependent of them. Microsoft has just stricken a major cost of their mapping platform and will certainly use this new asset to reach more countries with LBS for fewer costs. Microsoft put in a great fight making Bing Maps as gorgeous as Google’s, but was never able to offer navigation. Part of the reason for that are the additional costs for performing live navigation on procured data. Another part is the technical capacity to do turn-by-turn instructions on a moving handset. The deal with Nokia tackles both problems. This is great news especially for European smartphone users. The Google navigation option is only viable within country borders, due to restricitive costs of data-roaming and offline navigation is still comes from premium-cost apps. Location Based Services Apps, as well as any type of geomarketing campaign or analytics tool, depend on excellent mapping API’s. Unbeknown to many users, behind the scenes there are webs of dependencies on API’s and cloud data services to bring these location services to the phone. 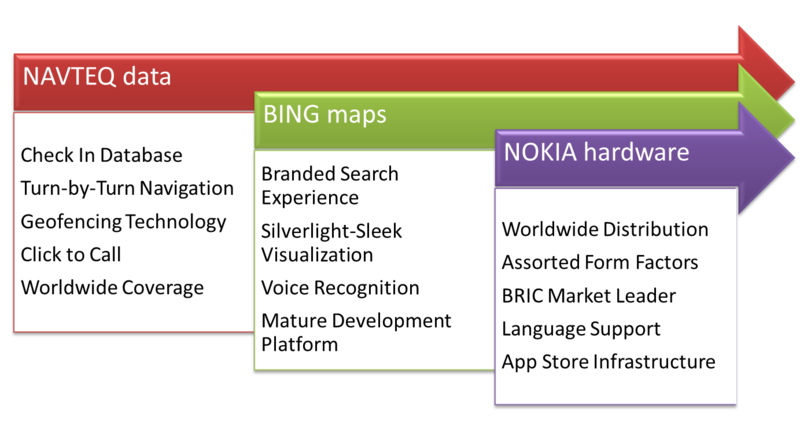 Microsoft and Nokia jointly offer a great combination of mapping and data services to developers that are now obliged to use sometimes competing services (e.g. foursquare using google maps). I’m going out on a limb a bit on this one, but since the NAVTEQ database has millions of important POIs, such as restaurants, business listings and retail outlets, it would not surprise me if these will be made available for free to LBS App builders. Remember that in order for foursquare to have you check-in, they need a huge database of places. Google has a huge competitive advantage over foursquare and Facebook for having their own Mapping services and Places database already linked to Latitude. Microsoft and Nokia can now offer a similar disambiguated database of check-in spots to App builders such as facebook and foursquare, since they have no skin in this game. They both just want to offer a platform.